Sparks fly at Selbak after wild clearance. 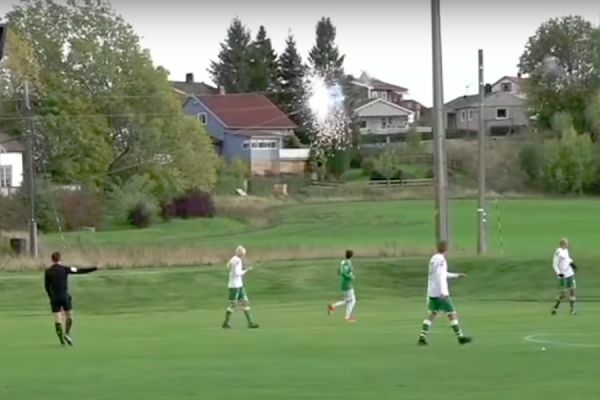 The ball was kicked into some overhead power lines causing sparks to fly at Selbak during their Norwegian 3. divisjon Group 2 clash with Vestfossen on Saturday. Damage was caused to the cables behind the goal at Selbak Stadion in Fredrikstad late in the second-half when a wild clearance appeared to dislodge one of them and cause it to droop. Players and spectators alike stood to watch the fireworks as the referee signalled for a throw. No further goals were scored and the hosts slumped to a 0-5 defeat leaving them bottom of the table by some distance with no wins to their name as the end of the season approaches.